When I first came to Rotterdam one of the first things I noticed and instantly fell in love with were the bridges, the water, and the water taxis: small yellow and black boats that race through the water with an incredible speed (those are the quick modern ones there are also traditional wooden boats), it is a great way of transport, and will take directly to and from a lot of great waterfront hotspots places like for instance Aloha Bar, Hotel New York, Leuvehaven, SS Rotterdam or Kinderdijk. 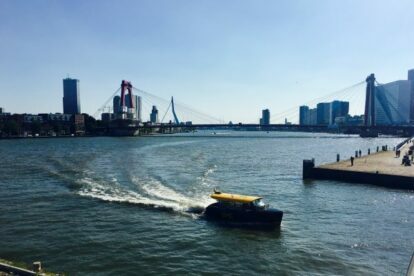 But also when you are going somewhere else it is always a nice idea to take the water taxi, even if it is just so you can experience Rotterdam by boat! A trip with the water taxi will set you back between €4.50 and €10 depending on how far you want to go. Reservations can be made online, on the same day or anytime before. You can get on boad at any of the waterfront stations (there are lots of them, check the website for more information).